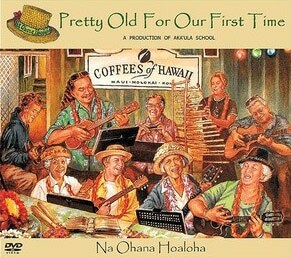 This Pretty Old for Our First Time DVD plays relaxing Hawaiian music, perfect for your holiday getaway this Christmas season. This DVD incorporates the breathtaking sights and melodies of Moloka’i traditions as they are perceived by these talented musicians. Heartwarming Hawaiian tradition is captured in this DVD as these excellent musicians showcase their talents, traditions, and culture. The captivating views of sunsets, Hawaiian seashores, and tropical festivities create a relaxing atmosphere this busy holiday season. The video features live performances from some of Hawaii’s most talented artists, and includes both traditional music as well as original compositions to demonstrate the power of Hawaiian tradition and how it continues to present itself in modern times. Bring to beauty of Hawaii’s Moloka’i to your loved ones this Christmas, and share some Moloka’i mana! Purchase this Pretty Old for Our First Time DVD, and bring your entertainment room to the shores of Hawaii. A portion of the profits from DVD sales will benefit the Aka Ula School.